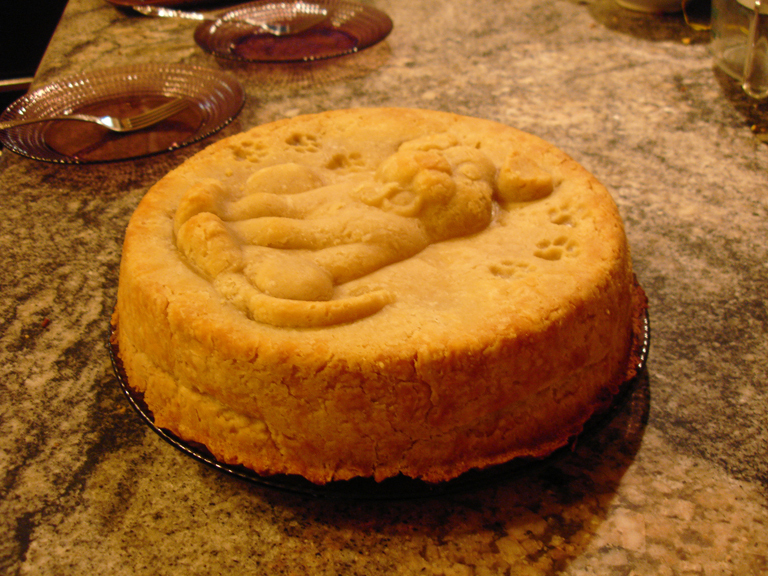 Deep Dish Upside Down Apple Pie with a Puppy on Top! Nick and I had a craving for apple pie. I really wanted to use the Puppy Mold and he really wanted to use the Peeler/Corer/Slicer Contraption because it was much more fun than cutting apples into chunks (see below). We decided to make a deep dish upside down pie. 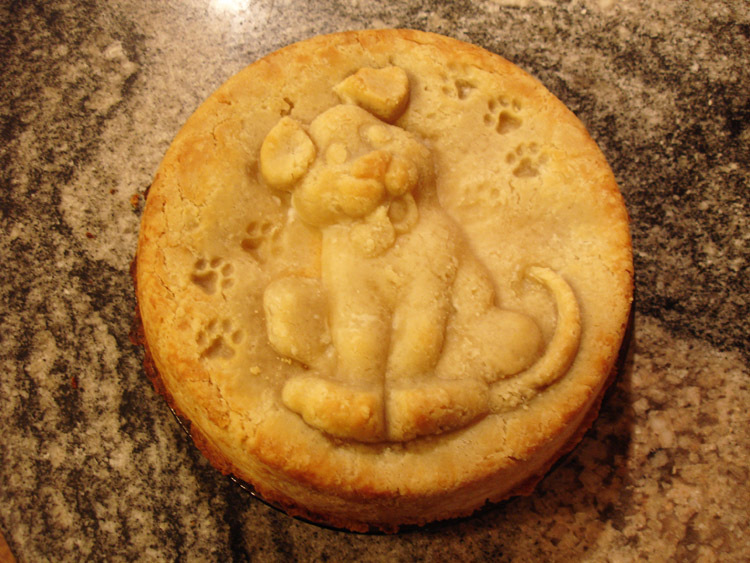 You also could make just a Puppy ‘Topper’ for your pie and use a standard pie pan, as with the Butterfly Pie. You can find the basic pie crust recipe on the ZP website. We doubled the crust recipe and used about six or seven medium sized apples. You’ll also need to mix up about 2/3 cup of flour with 2 or more teaspoons of cinnamon and 1 to 2 cups of sugar (depending on how tart your apples are and how big your sweet tooth is). You’ll use this to sprinkle on the apples. You’ll also need a little butter to dot on the top before adding the top layer of dough. 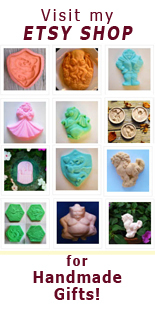 Dust your mold lightly with flour. 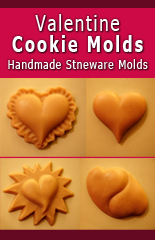 Once you’ve made your dough, roll out a circle and fit it into the Puppy Mold – or just press dough into mold in an even layer into the bottom and up the sides. 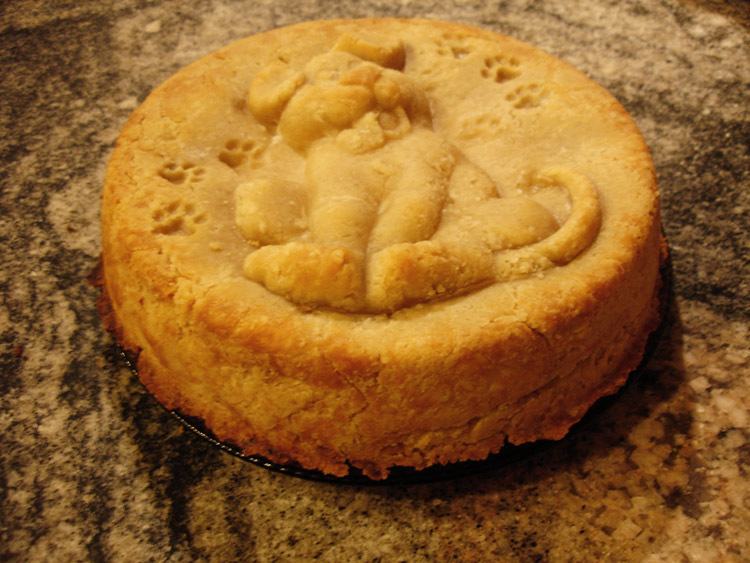 Be sure to press the dough completely into the Puppy design – you will probably need to add extra pieces of dough in the deeper areas of the design to keep the crust an even thickness. If needed, moisten dough slightly with water to stick pieces together. Dip your fingertips in flour before pressing the dough in and be sure that the bottom and side crust are not too thin. 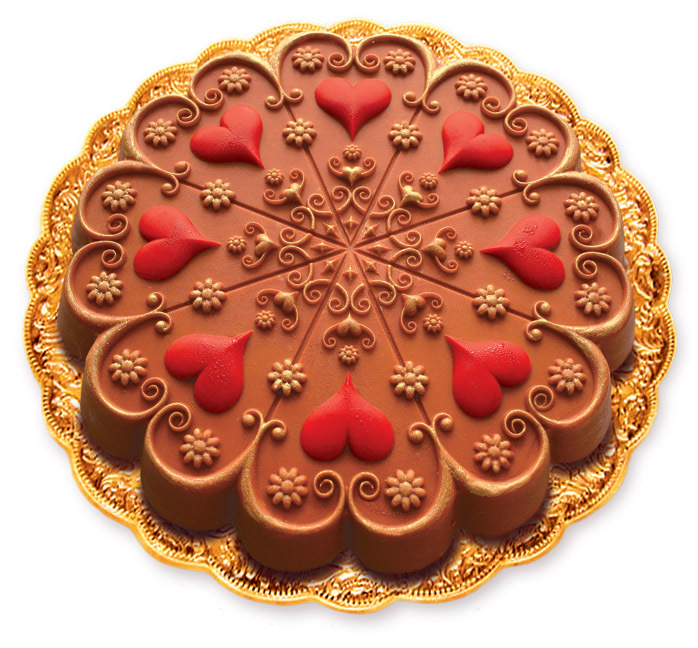 If you’ve used the Heart Mold for pies, this might be a little bit fussier, as the Puppy Mold doesn’t have a flat bottom. You will get a little ‘bounceback’, but it’s not hard to do at all. Once you have a shell of dough covering the interior of the mold, sprinkle a little of the flour/sugar/cinnamon mixture on the bottom, then sprinkle more between layers of apple until you have a slightly mounded top (see images above). Dot the apples with little cubes of butter, then roll out the top layer of dough (which will become the bottom crust of your upside down pie), place on top, crimp the edges and cut several small vents in the top layer. Bake at 375 to 400°F (200 °C) for 50-70 minutes. Tent with foil if top layer of crust browns too quickly. Pie is done when filling begins to bubble out. Allow to cool for at least 30 to 40 minutes. Place serving plate over mold, flip plate and mold over together, then gently remove mold from pie.